This double live/studio album was my first encounter with YES and also a very good choice to discover their enchanting world. After their FM period during the 80's, the musical direction taken by the band could not last anymore during the explosion of grunge, hip-hop and techno explosion of the first half of the 90's. Thus Jon Anderson decided then to reform the 70's classical line-up (with Alan White instead of Bill Bruford) and to go back to the progressive successful format that made them famous. The live part simply compiles one of the best tracks from their 70's studio records, except "Time and a Word" and "Relayer". There are two curious choices though. The first one is the average "Onward" from "Tormato" (why not "Don't Kill The Whale"? ), the weakest YES' album of the seventies. The second is the extended 10 minutes cover version of SIMON & GARFUNKEL's "America". Original, groovy and charming, but a little out of place. The studio version was initially released as a single in 1972 and can now be found in the remastered 2003 Elektra edition of "Fragile". Overall, the live renditions are pretty good. The studio part consists in two compositions from 1995-1996. "Be The One" is simply one of YES' best songs of the 90's! A melancholic and catchy fantasy prog track that rocks! The 19 minutes suite "That, That is" has a few good moments, however unfortunately does not overall present the same interest. These two tracks are now compiled in the "Keystudio" album, released in 2001. 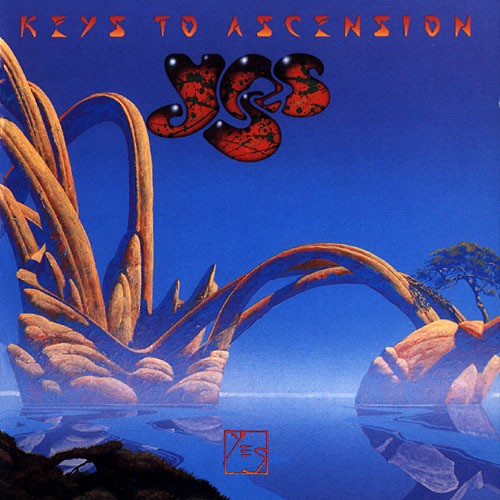 Better than Volume II, "Keys to Ascension I" is one of the best YES' live albums. Furthermore, the cover art is very nice. Recommended to the band's fans and ideal for newcomers to discover their magical music!